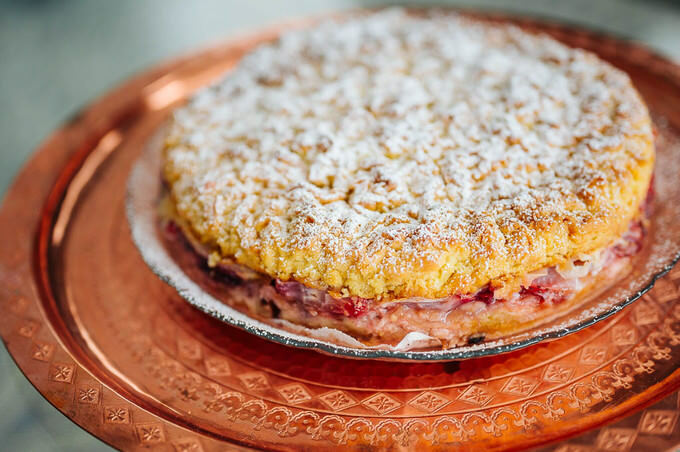 At times I feel like I am not grateful enough that I can whip up this strawberry pie in the dead of winter. I grew up when and where strawberries were very much a seasonal fruit. Well, in many parts of the world that is still the case. Let’s toast (or let’s eat a slice of the pie) to show our gratitude for being able to bake this beauty any time, any day! Oh, I also forgot to mention that I like to toss anything I might have lingering in the refrigerator. Not like chicken or bacon, I am talking about fruits and berries. The crust is so versatile, it can handle quite of bit of moisture, too. But please do not cut on the bake time and do not skim on the fruit. This time I am adding 3 small apples into the mixture. In my mind apples and strawberries just mix and they mix well! 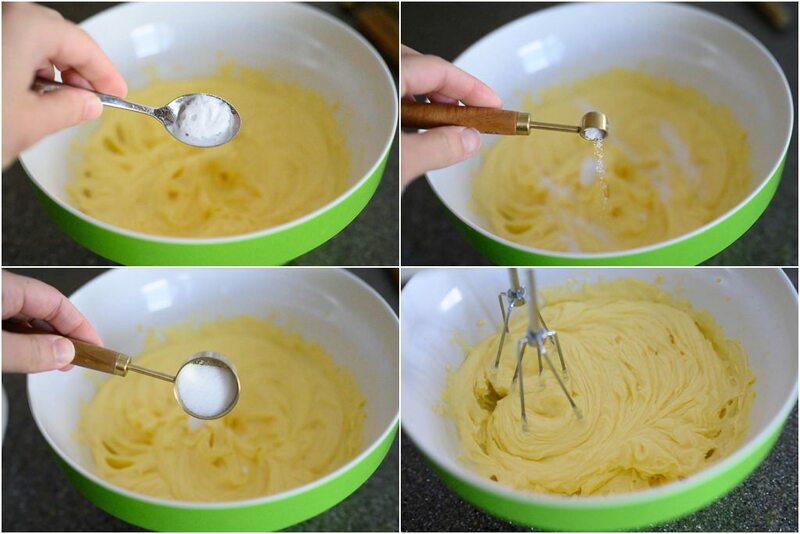 Separate egg yolks from whites. Place yolks in one medium container and whites in another. 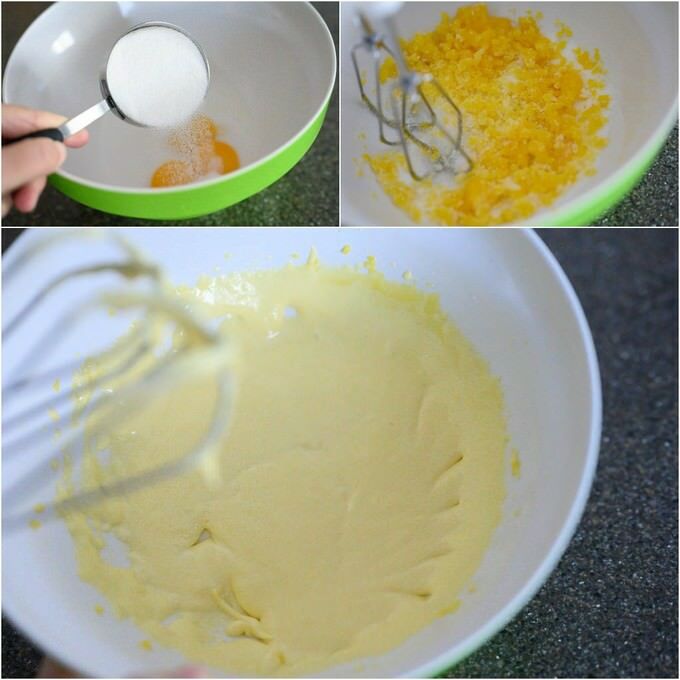 Whisk yolks with 3/4 cups of sugar. The mixture will turn pale yellow in a bit. Add softened butter. The butter should be room temperature. You can also melt the butter in the microwave. Just make sure it has cooled down enough. 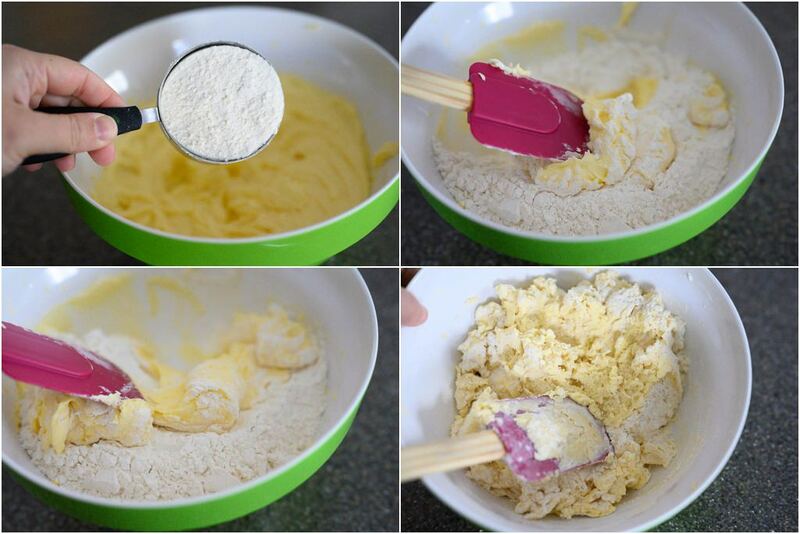 Mix the butter into the egg/sugar mixture. 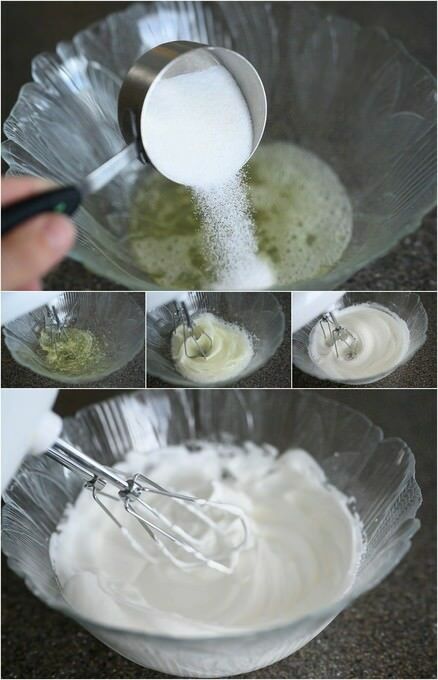 Add baking soda, vanilla, a pinch of salt and lightly mix all of the ingredients. Slowly add flour and mix all of the ingredients by spoon or a spatula. 2 cups of flour are generally enough (considering you are using a 250ml cup). Incorporate the 2 cups in first. If you feel like it is still not enough, add half of 1/2 cup and see where that takes you. Once the flour got somewhat incorporated, use your hands to gently knead everything into a dough shape. The dough should be soft to the touch but not sticky. It is actually quite airy and very fluffy. Even if your dough turns our a little denser, no problem. It will still bake beautifully. DO NOT over-knead the dough. If you handle it too much the butter will start separating from the rest of the dough and that’s just not good. 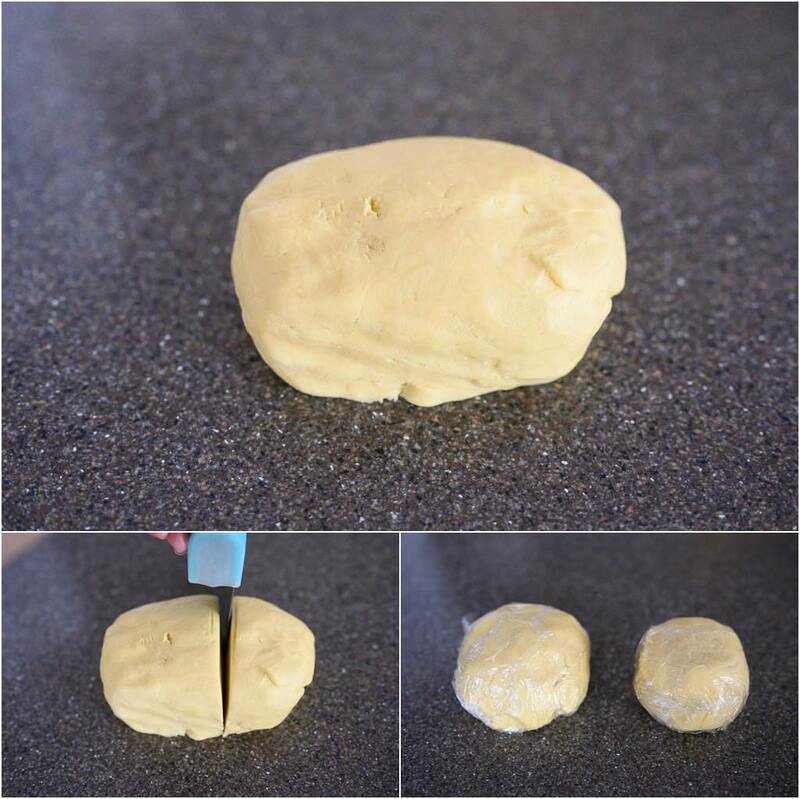 Divide the ready dough into two: one larger one smaller. The larger part will go on the bottom of the baking pan. The smaller one will be used as crumbs on top of the pie. Put the smaller portion of the dough into the freezer to harden. You will take it out once you’ve assembled the bottom part of the cake into the baking pan. The larger portion can be kept in the refrigerator until needed. If you are using apples along with strawberries (my personal favorite combo), peel them. Hull the strawberries and slice them lengthwise. Lay parchment paper on the bottom of a 9-inch springform pan. I prefer to lock the parchment paper in between the shell and the bottom of the springform pan. This way all the drip can be trapped inside the pan, rather than sipping out onto the oven. Bring out the remaining egg whites and beat them with 1/2 cup of sugar. Beat the egg whites for about 5-6 minutes until white peaks form. 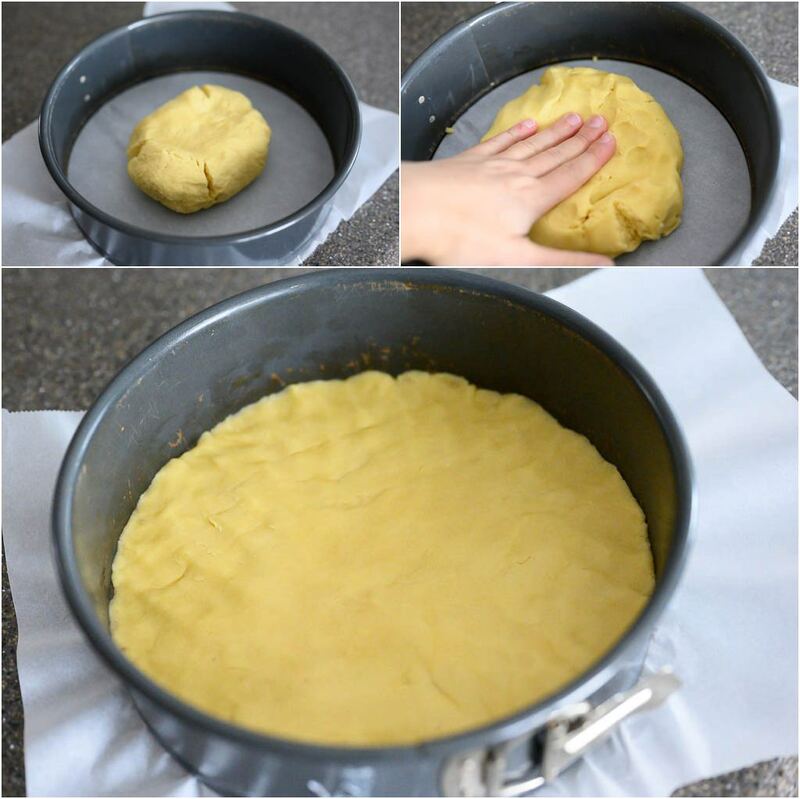 Take the larger dough and evenly spread it out on the bottom of the baking pan. Grate the apples on top of the dough and even them out. 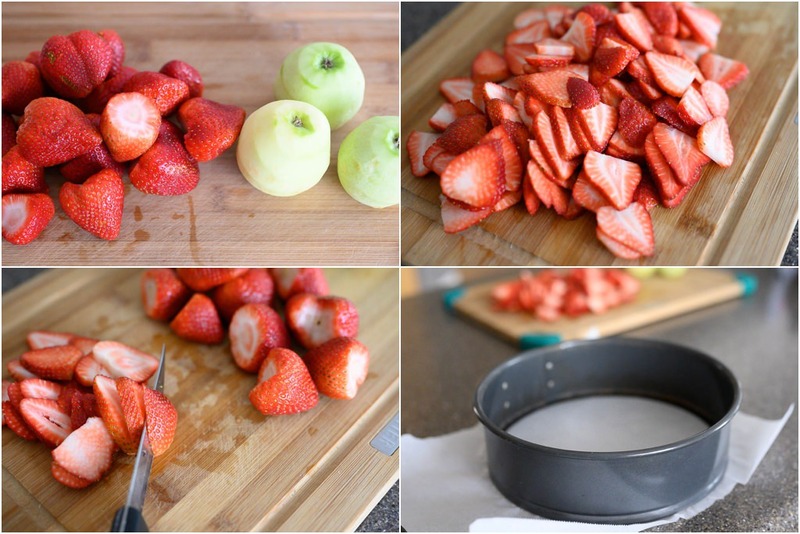 Evenly layer sliced strawberries on top of the grated apples. 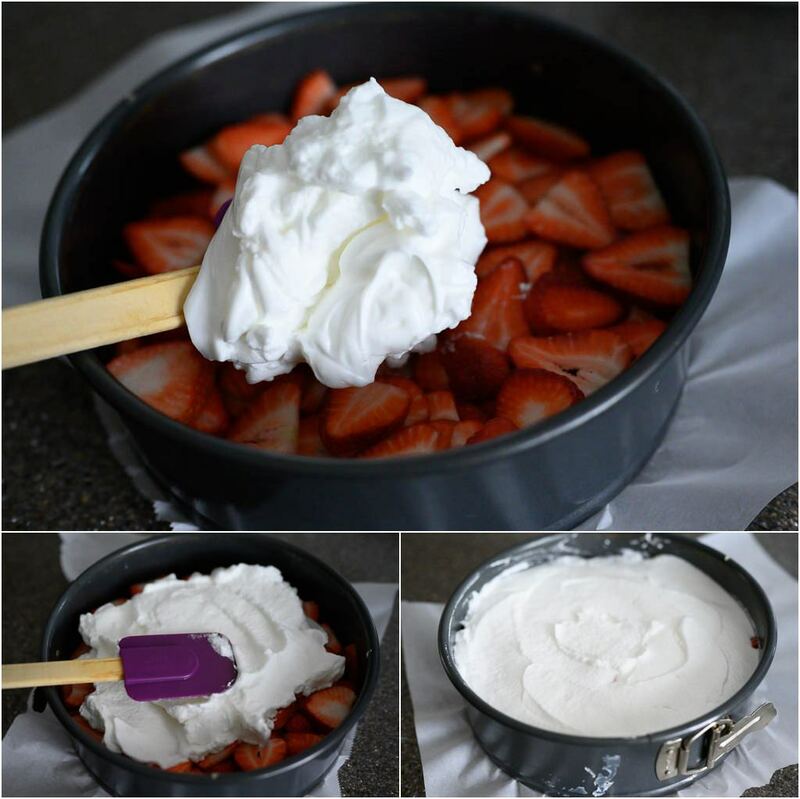 Gently spread the egg whites on top of the strawberries, making sure it is laying evenly. 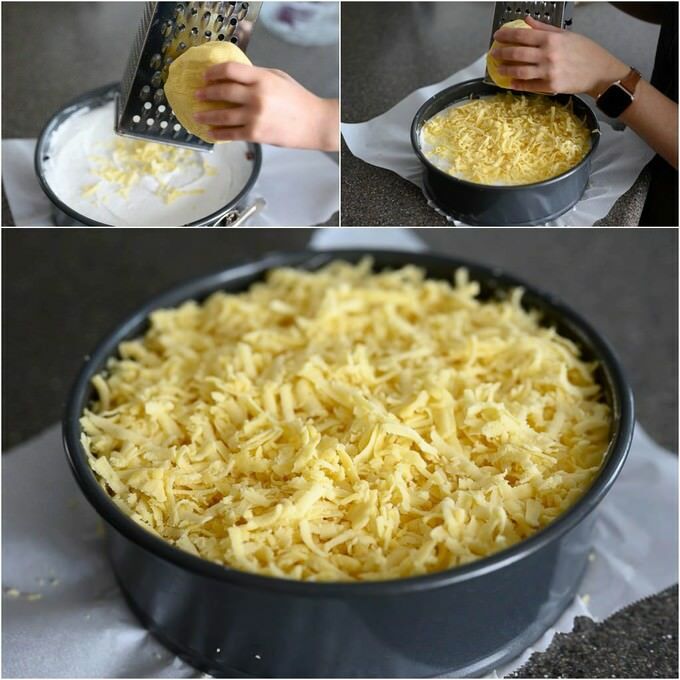 Take out the smaller dough from the freezer and using a clean, dry grater quickly grate the dough on the surface of the pie. Even out the crumbs throughout the surface of the pie and stick the pie in the preheated oven (350F). The pie will bake for an hour. If you notice that the top is browning too much, just place an aluminum foil on top of it. This pie will need its full 1 hour in the oven. Otherwise, the bottom will be undercooked and too wet. Also, the pie might puff up in the oven. This is due to the meringue layer that we added under the crumbs. That is totally fine. You do not have to deflate it. The pie will “calm” down once it is out of the oven. Fully cool the pie once it is done baking. Using a spatula loosen the sides of the pie from the pan and gently lift the pan open. Voila! You are ready to devour this magnificent of a strawberry pie! 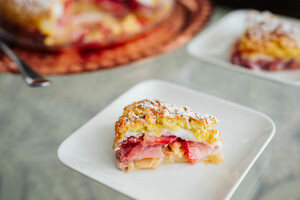 This is THE melt in your mouth delicious strawberry pie recipe which gets requested in my house, by my children, more often than anything else. One of my friends gave me this recipe about 10 years ago. It is very easy to make, very refreshing and delicate. Once the flour got somewhat incorporated, use your hands to gently knead everything into a dough shape. The dough should be soft to the touch but not sticky. It is actually quite airy and very fluffy. Bake the pie for 60 minutes. 1. Even if your dough turns our a little denser, no problem. It will still bake beautifully. DO NOT over-knead the dough. If you handle it too much the butter will start separating from the rest of the dough and that’s just not good. 2. The pie will bake for an hour. If you notice that the top is browning too much, just place an aluminum foil on top of it. This pie will need its full 1 hour in the oven. Otherwise, the bottom will be undercooked and too wet. Also, the pie might puff up in the oven. This is due to the meringue layer that we added under the crumbs. That is totally fine. You do not have to deflate it. The pie will “calm” down once it is out of the oven. Свет – бесподобный, слов нет. Такое ощущение, что не дома (не у вас дома) фотографировали. Lola , I am very admired by your so delightful recipes! I love your blog! Love the recipe! I had trouble grating my apples, they were just turning to mush so i sliced them really thin (maybe my grater holes were too small) Its fun to make and more interesting then a traditional pie. Its in the oven right now and smells FANTASTIC! Cant wait to taste it. Thanks for sharing!